Help @nascarcasm, @steveluvender choose Twitter-suggested retirement gifts for Dale Jr.
We asked, and you delivered. Not long ago, we tasked you, the good folks of NASCAR Twitter, to help us find a retirement gift for Dale Earnhardt Jr. — who, if you haven’t heard, is retiring from full-time driving at the end of the 2017 season. You gave us a lot of tremendous suggestions — and for that, we thank you — but here are a few of our very favorites. These are the gifts that really captured the “regift in two months” spirit of the whole thing. And, of course, they fall within our very generous budget requirement of $88 or less. Believe us, it was tough to narrow down to these few options. The NapSack really appealed to us for several reasons. First and foremost, it fits our most important requirement of “no one should own this.” Furthermore, it’s well within our $88 price range — in fact, we could gift Mr. Earnhardt eleven NapSacks. Junior’s going to have a lot more time on his hands next season, but he still runs a race team and hangs out in the office, after all. What better way to nap on the go than with a NapSack? 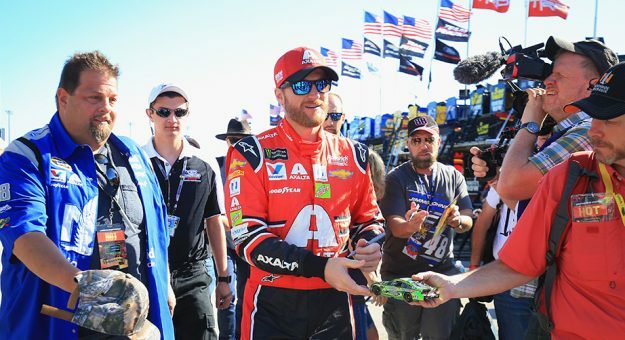 Even though Dale Jr.’s not racing full-time next year, he’ll still be part of the action, announcing races for NBC. And, of course, if he’s going to be on camera, he’ll need to wear some snappy clothes that still speak to his personality. That’s where this fine Washington Redskins business jacket comes in, thanks to a suggestion from @_F1yer_. We managed to find an identical blazer emblazoned with a beautiful repeating logo pattern of Dale Jr.’s beloved Washington Redskins — on eBay, of all places. That’s two Junior faves in one, if you’re keeping score. And, thankfully, it fits well within the $88 budget, priced at just under $30. With Dale Jr. spending a little more time at home after this season, it means he’s going to use the bathroom at his house a little more, too. Nothing’s worse than stumbling around in the middle of the night searching for the toilet bowl — both walking toward it and placing contents into it — so why not lend a hand by offering a comforting, motion-sensing neon glow inside the bowl? At least, that’s the idea behind this $15 motion-sensing light that you place inside your toilet for those tough-to-see moments. Useful? Maybe. Out of all the gifts that were suggested, this is probably the item that would be peed on the most — and believe us, that was an important area of consideration. We have this! It’s actually super awesome when stumbling in the middle of the night! Definitely within budget — we can order five lights with our $88! It was a good thought, Natalie. Thank you. There’s nothing people enjoy more in retirement than shuffleboard — at least, that’s why there are so many shuffleboard games found in retirement homes, we think. Full-size shuffleboard tables appear to slightly exceed our $88 budget we’ve saved for Junior. How can we give Dale Jr. the gift of shuffleboard without breaking the bank or sending him a link to use a $2.99 shuffleboard app for his iPhone? The answer is a tabletop shuffleboard game, of course. This tabletop shuffleboard, suggested by @retired2live, comes in at exactly $88 — precisely in our budget. Plus, the suggestion comes from someone with “retired” in her Twitter handle, which validates this gift’s interest to a retired individual. We like the way you’re thinking, Kristen. We’ve already seen what happens when Dale Jr. fires a blast of salt on Twitter, so we’re naturally excited to see what happens when armed with a plastic, actual-salt-firing device. Plus, one of the Bug-A-Salt’s colors is priced at $83.49 — comfortably within our budget, even once we include a container of salt as a refill. Thank you for the thoughtful suggestion, Darrell. Now, we need you again. We’ve got five fine finalists, but we need your input on which retirement gift we can send to Dale Jr. Please tweet us — @nascarcasm and @steveluvender — which of these gifts we choose, and we’ll commission an impartial third party to scientifically count the votes and determine a winner. Thank you, citizens of NASCAR Twitter, for your participation and enthusiasm. We hope we make the right choice to send Dale Jr. off into the sunset the way we’d like.